All temple members and their friends are invited to join us. 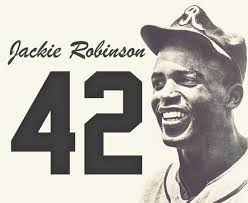 “Bud” Livingston, a noted lecturer, sports historian, educator, will lead a presentation on the baseball life and times of Jackie Robinson, the baseball great. His presentations are sprinkled with a significant amount of data that never fail to surprise audiences. Livingston encourages all who listen to become engaged by sharing their knowledge and stories along with posing questions. If you saw the movie, “42” you know that this historic and touching story is for all genders. It will be a night that you won’t quickly forget. The program will follow a short business meeting, where we will celebrate our members’ October birthdays, a few days early. A light collation will conclude the evening.